Pub Crawl Tickets On Sale Friday!! Friday is the day! At 8:00 AM, limited tickets will be released for the Twins Daily Touch Em All Pub Crawl, and today we get to announce the final stop and giveaway, plus the great prizes you can win and the crazy price. Our final stop will be Darby’s Pub, just one block from the stadium, who will be providing each attendee with a free craft 612 Brew (a $6 value). We’re also very happy to announce that AME Sports is providing great raffle prizes at each stop, including plaques gorgeous plaques of some of your favorite Twins players AND a replica 1987 World Series Champion ring! 1. A high-quality men’s/women’s triblend Twins Daily Pub Crawl t-shirt (value $15) with our official tongue-in-cheek “Crawl to 100 Losses” logo (below). 2. A free brewery tour (value $6) at Modist Brewery (1st stop, noon-2:00 PM) at 12:30, 1:00, or 1:30. 3. Free parking (value ($10) at The Freehouse (2nd stop, 2:00-4:00) for the duration of the event and game. 5. Entrance into our raffle of Twins sports memorabilia (value ~$200) from AME Sports, including player plaques and a replica 1987 World Series ring! 6. A ticket to the 6:00 Twins game (value $14), where you’ll see a special event that we’ll announce tomorrow. We care about getting everyone together, so we've negotiated all this for $30 (or $15 if you don’t need the Twins ticket). But tickets are only available through Monday night, and may not last that long given you’re getting about $50 worth of stuff for $30. Plus, of course, you’ll get to meet a ton of great Twins fans and writers and drown our sorrows in our beers together. Darby’s is an especially great place to gather before the game when the weather is nice, as they have an enormous hidden deck just a block from the ballpark. They’re going to be providing a keg of 612 Brew, which has supported several of the Twins Daily events, for our group. 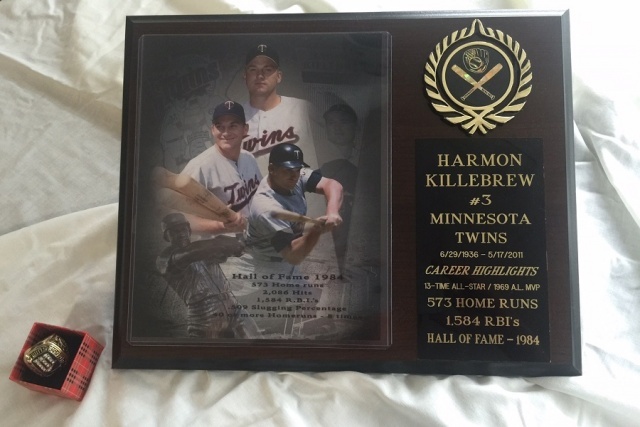 And AME sports is providing plaques like the one below featuring Harmon Killebrew, Miguel Sano and Brian Dozier. We’ll raffle one off at each stop. 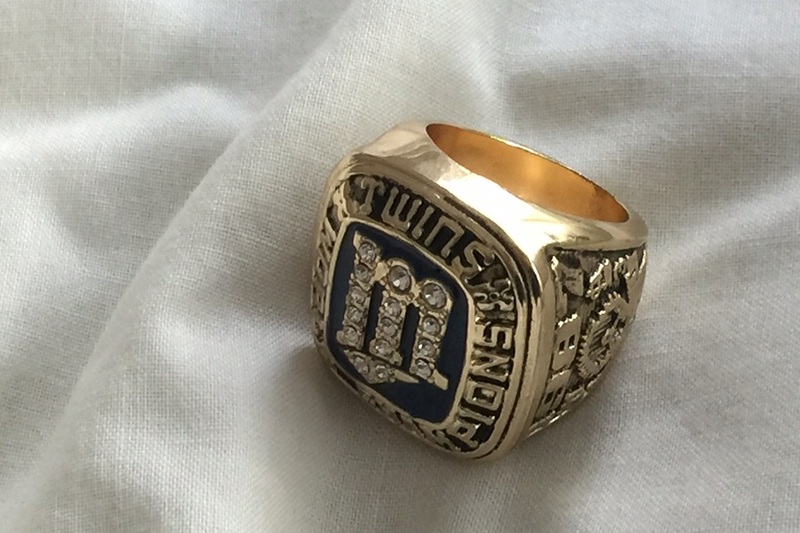 Finally, we have a 1987 World Series Champion replica ring that will be awarded to the attendee that … well, you’ll need to check early tomorrow to get in on that action. We’ll see you tomorrow and hopefully on September 24th. → Article: Pub Crawl Tickets On Sale Friday! !